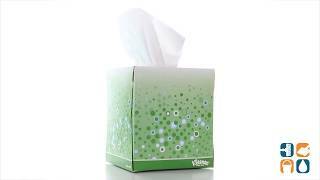 The Kleenex Antiviral tissue has three soft layers, including a moisture-activated middle layer that kills 99.9% of cold and flu viruses. When moisture from a runny nose, cough or sneeze comes in contact with Kleenex Anti-Viral tissue’s special middle layer, cold and flu viruses are trapped and killed preventing the spread of germs. Each tissue is 8.4"x 8.2" in size. White. 68 tissues per box. Includes one box.